"I said this train...dreams will not be thwarted...this train...faith will be rewarded!" 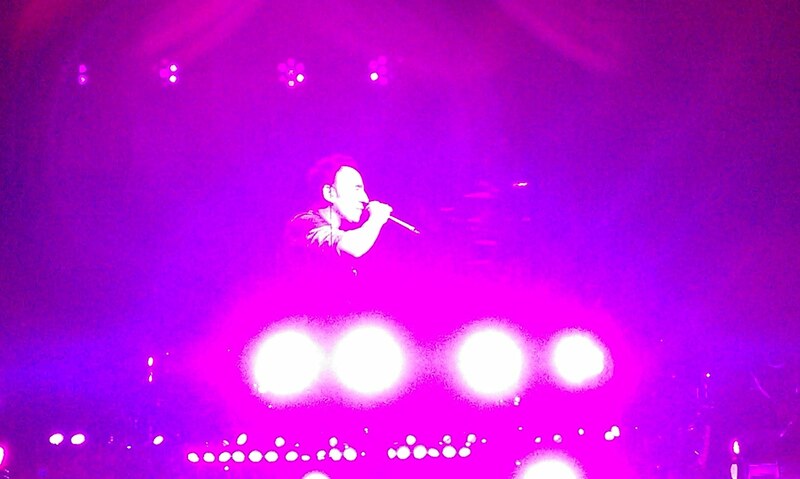 assured Bruce Springsteen in his concert opener, "Land of Hope and Dreams." In a world where trials, tribulations, and loss are too commonplace, this New Jersey hero and his music continue to summon a gravitational pull of encouragement. There have been inspirational figures throughout history—beacons of light that remind us to persevere. It's in this archetypal position that Springsteen finds himself; as his legend deepens over the years, and as newer generations are drawn to his communal uplift through strife-scarred yet hopeful anthems and songs of unabashed joy, it is difficult to name a peer of his not only doing what he does, but doing it so smashingly. 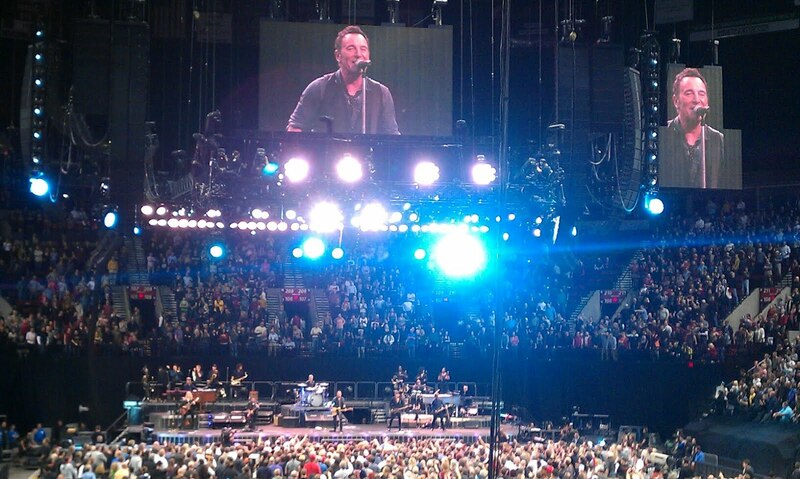 At the Rose Garden, facing another screaming multitude that is just another day's work, "The Boss" lived up to his almost saint-like expectations, delivering over three hours of hope, reflection, and fun. Touring in support of their new album Wrecking Ball amid an election year, the Jersey Shore-devastating hurricane Sandy, and continuing economic turmoil, Springsteen and the E Street Band (guitarists Stevie Van Zandt and Nils Lofgren, drummer Max Weinberg, pianist Roy Bittan, bassist Garry Tallent) honored their mission and recognized their fallen brothers, saxophonist Clarence Clemons and keyboardist Danny Federici. And as Springsteen's lyrics often remind, no one walks alone, so 11 additional musicians were on hand, including Clemons' talented sax-playing nephew Jake, to help raise spirits and the roof. 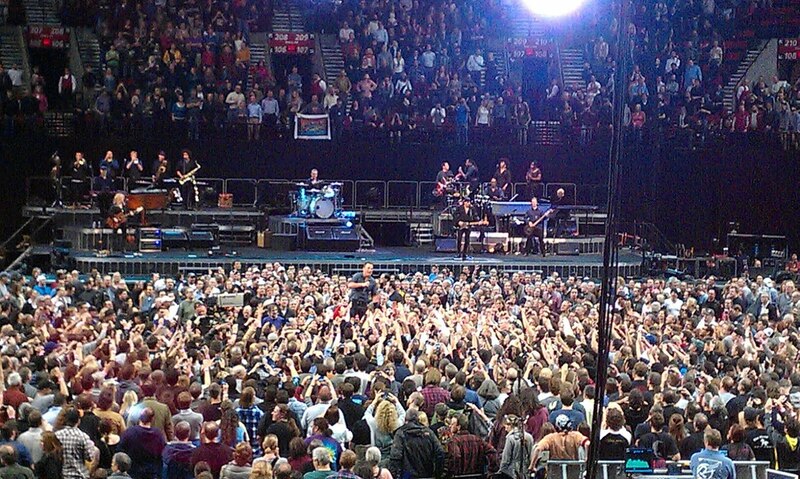 With the large head count onstage, not to mention the high amount of energy exchanged between the audience and the performers on this night, it must be observed that Springsteen's concerts, taken historically, just don't achieve parity with this 2012 show. That's not at all to say this is the best tour he's done, it's just that the current Springsteen live experience is a vastly different, more immense animal than in the past. It is a more frequently joyous communion now, in contrast to earlier periods where the reliable rock n' roll party was often acutely tempered by a purposeful, singular, and serious vision being telegraphed from the stage: there was the prove-it-all-night, walk-on-tables seaside bar band era; his redemptive mid-1970s arena takeover after Born to Run; his college auditorium tour for Darkness on the Edge of Town, an album born out of creative and legal struggles; his mercenary Born in the U.S.A. global takeover; his dark, contemplative solo tours behind Ghost of Tom Joad and Devils & Dust; his E Street reunion tour/rock n' roll revival of 1999-2000; his solemn post-9-11 trek forThe Rising; the Seeger Sessions Band folk hoedown; and the late-2000s Magic tour which, while expectedly euphoric at turns, at certain points dutifully referenced stacked bodies of war dead and "the bitter fires of the devil's arcade." In 2012, Springsteen could have understandably turned the gloom dial to 11 in response to our times, and particularly due to the landscape-altering death of the larger-than-life Clemons, whose absence onstage, and how Bruce would address it, weighed mightily on every fan as they anticipated the E Street Band's future. An answer to this came on this night during "My City of Ruins," a gospel-tinted number where Bruce asked us all to remember our dearly departed, and, to stirring effect, he turned the Clemons-referencing lyric from another song, "The change was made uptown..." into a brief mantra. Ultimately, a pair of spotlights shone down on empty spaces that both Clemons and Federici once filled. It was a heart-rending moment that urged healing and gave both the entire Bruce juggernaut and his audience permission to live on and move on, if for nothing else to honor the dead. Indeed, life and movement were in order here, with many exhilarating sing-alongs (a brisk "No Surrender," the swelling, horn-driven "Spirit in the Night," the insistent "Badlands"), fresh new material (the punchy reminder "We Take Care of Our Own," the Irish folk stomper "Death to My Hometown"), and the pensive, solo-Bruce highlight "If I Should Fall Behind." The Wrecking Ball ballad "Jack of All Trades" found Springsteen singing "There's a new world coming, I can see the light/I'm a jack of all trades, we'll be alright," lyrics that distill the man's entire ethos in short order. And any air of separation between fans and artist? Left at the door. Springsteen crowd-surfed during "Hungry Heart," and when he wasn't literally playing Santa Claus and wearing a red hat (the seasonal imperative has them playing "Santa Claus is Comin' to Town"), provided Santa-like wish fulfillment to several lucky fans by heeding song request signs (The River-era songs "Drive All Night" and "Loose Ends" were the finest of these) and by pulling a virtual Courtney Cox dance troupe onstage during "Dancing in the Dark"; it's a safe bet that Cox could have never predicted that her awkward dancing with Bruce in a music video would still be reenacted 28 years later. The E Street Band origin story "Tenth Avenue Freeze-Out" ended the show with the Boss on a center-arena catwalk and a dramatic pause/video tribute to Clemons prior to Springsteen's famous shout-out, "When the change was made uptown/And the Big Man joined the band..." Big Man is no longer onboard, but this train is still racing toward glory.